The second part of my recent holiday took in Cornwall and the Penwith peninsula. 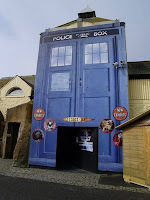 The farmhouse where we were stay was only a few miles from Land’s End, where there is a permanent Doctor Who Exhibition. I had seen a lot of pictures on the net from the recent Earl’s Court Exhibition, but none from Land’s End. So I set about putting that right. The outside of the Exhibition is decked out like a massive TARDIS, and you enter through the lower part of the front door. It’s £4 to get in, which isn’t too bad, considering Earl’s Court was £9. When you first go in, after passing a ticket collector, you walk up a low-rise, wide, curved staircase, along one wall of which is a display of photographs of the first nine Doctors. At the top of the stairs is a panel introducing “New Companions”, but strangely not the tenth Doctor. I thought that a little odd. 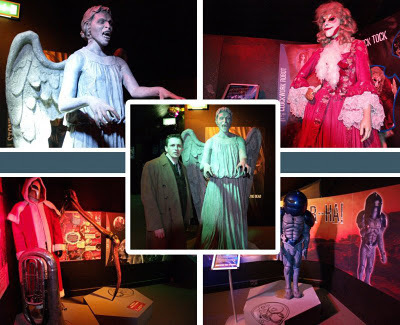 The first costume displays you come to are an Angel (below left) from Voyage Of The Damned, and a boiler suit for a Lumic Work Technician (below right) from Rise Of The Cybermen/Age Of Steel. The latter not being the most exciting of costumes to begin the exhibition with. Turning a corner you then see a gauze display (see left) from The Next Doctor, which when back lit, reveals the head of the Cyber Leader. It is only illuminated for a few seconds every couple of minutes, and being one of the more up to date displays, you would have hoped to have seen it clearer for longer. For all you can see of it, it may as well be a Voice Changing Face Mask from Argos! 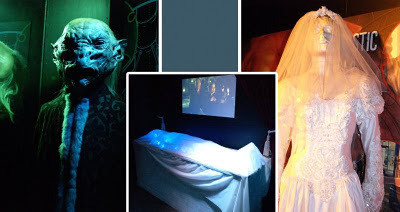 The next room has an Alien from The End of the World (below left), The Gleth from The Unquiet Dead (below middle) and an Auton Bride from Rose (below right). The next room features props and costumes from Aliens Of London/ World War Three, with a Slitheen (below), Pig Alien (below left) and a display of Passes and Trigger (below inset) in plastic domes. There is then a make-up display, focusing on the aliens from The End of the World, with the face of The Moxx of Balhoon with Jimmy Vee’s name on it (see left). This display is rather basic and not a patch on the Ood make-up display seen at Earl’s Court, which showed the same head at every stage of creation, making for a real fascinating display. The next room contained several displays, on in each corner. There was a Weeping Angel from Blink (below, top left); a Female Clockwork Figure from The Girl In The Fireplace (below, top right); a Santa Pilot Fish from The Runaway Bride (below, bottom left); and a Sontaran from The Sontaran Stratagem/The Poison Sky (below, bottom right). Beyond this was a boxed display of an Ood from The Impossible Planet/The satan Pit/Planet Of The Ood (see below). I like the Ood! They are omnipresent, having been on display at every exhibition I have been to since they first appeared in the series. I think it was about this point in the exhibition I noticed that with little exception, there was nothing truly unique on display. 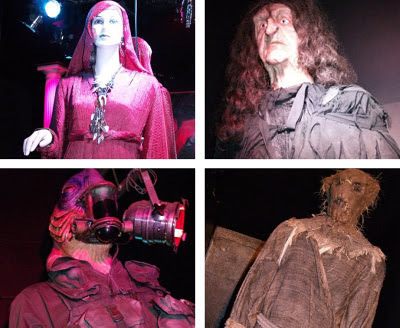 So far, the Angel, Lumic Technician, Cybermen, Cyber Shade, Auton, Slitheen, Weeping Angel, Santa, Sontaran and Ood, plus some others to come, were all seen en-mass in episodes, so there would be spare screen-used costumes available. There was nothing worn by any lead characters, ie either The Doctor, his assistants, or lead protagonists. It was starting to feel distinctly like a second-class exhibition. Beyond the Ood, on the way to the next room, is an old favourite, K-9 as seen in School Reunion (see below). I noticed that the rusting detailing around his corners (see left) looked totally different to the large picture on display behind him. Call me cynical, but I am sure that a number of items in these exhibitions are remoulds and not screen-used. The Daleks on display is a case in point I think, and I would not be surprised if the Cyber Leader and Ood heads here were Millennium FX reproductions, rather than screen-used. Next was another room of one in each corner displays containing a Hand Maiden costume from Fires Of Pompeii (below, top left); a Witch from The Shakespeare Code (below, top right); a Hath from Doctor’s Daughter; and a Scarecrow from Human Nature/The Family Of Blood (below, bottom right). Into the last room now, with a cliched ‘Do Not Press This Big Red Button’ (although in reality it is quite small, yellow and has a massive arrow pointing to it so you don’t miss it!) 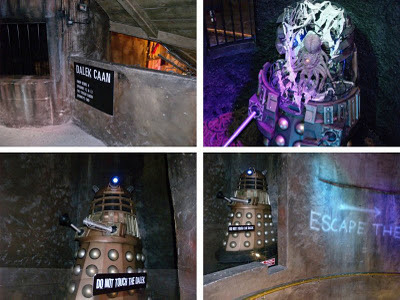 Pressing it opens a set of doors (see right) to find a dungeon beyond (below, top left) where the insane Dalek Caan from Stolen earth/Journey’s End is kept in a caged pit (below, top right). To the left, a Dalek (with a stumpy plunger arm for some reason) rises up to shout all manner of insults and hollow threats, with a polite ‘Do Not Touch The Dalek’ notice in front of it (below, bottom left). An ‘Escape Them’ graffiti points the way out. But it is not over yet . . . . on the left on the way out , high above head height, is a Show Girl from Daleks In Manhattan/Evolution Of The Daleks (below left) and below in a pit is a Pigman (below right) from the same story. Finally the exit door itself has a nice touch, with a ‘Bad Wolf’ graffiti on it (see above). So, all in okay an okay display, but not on the scale of Earl’s Court. There are some unique displays, but they are few and far between some more often seen costumes, which crop up at other sites. What I think defines this display though is what it does not have; there is nothing tangible with any of the lead actors; no Doctor or assistant costumes and no life size TARDIS. That is disappointing. But it was a good excuse to pull on the coat and suit, even if it was lost on the ticket collector on the door. I thought I would get a reaction from him. Maybe he has never seen the series. You can see all the pictures I took of this, and some of the other exhibitions I have attended, by clicking on the links below. I am often asked if I can be commissioned to make Tennant Coats. If you found this blog interesting, you might like to view my parallel blog about about making my Tennant Suit. Radio Times quiz - Can you list David Tennant's costumes in the right order?